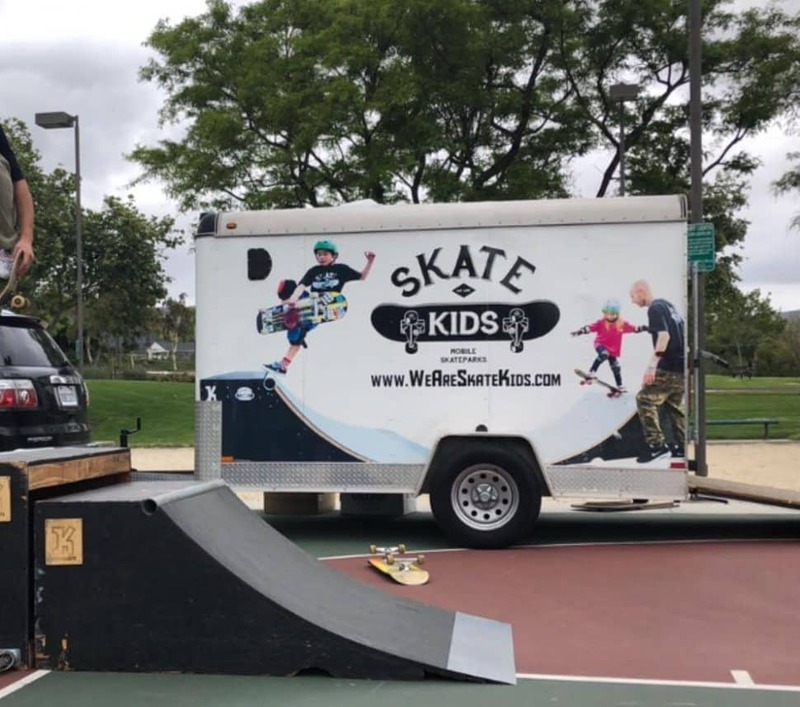 The Skate Kids trailer has been recovered in Compton. It was stolen Wednesday night in Lakewood and thieves tried spray painting over the logos. Photo courtesy of Kurtis Colamonico. Kurtis Colamonico is breathing a sigh a relief after a nerve-wracking night in Compton trying to get his Skate Kids trailer back home. The trailer, filled with all the equipment for his mobile skate park business, was stolen Wednesday night from the Lakewood mall while Colamonico was eating dinner. He spent the next 24 hours frantically posting photos of it on social media, asking if anyone had seen the trailer. This Skate Kids trailer was stolen from George’s Greek Cafe at Lakewood mall on Nov. 28, 2018 shortly after 6:30 p.m. Photo courtesy of Kurtis Colamonico. Colamonico uses the trailer and the equipment inside to teach kids how to skateboard in after-school programs, group lessons and camps. Skate Kids has been in business for four years and has been part of Long Beach’s Beach Streets event since 2016. He didn’t get any leads until the Beach Street Facebook page shared his plea for help. A woman messaged his own page and the Beach Streets page with the exact address where she saw the trailer in Compton. “I just went and grabbed some friends and drove there,” around 10 p.m., Colamonico said. They called police, but they said they couldn’t come out to assist in recovering the trailer. Luckily, the trailer was unhitched on a street in front of a house in Compton. But, the thieves had broken the winder for the trailer stand, so they couldn’t just attach it to his car and drive it away, he said. He and his friends ended up making enough noise that someone called the police, and deputies arrived. Colamonico had all the paperwork and the original police report to prove the trailer was his, so the deputies ended up helping them break off the stand with a sledgehammer and released the trailer into his custody. “It was a little scary at first, there were cars driving around real slow and making U-turns,” on that street, he said. They finished attaching the trailer and left the area around 1 a.m. The thieves had also spray painted over the Skate Kids logo and contact information that was on the trailer, broke the back door so it can no longer close all the way and removed the license plate. Most of the equipment was still inside the trailer—just jumbled—but the skateboards were gone. The trailer is still usable, but he has to make some repairs. He has already bought some new skateboards, so he can teach today’s lessons.